Family Favorite Potato Salad Recipe – is a classic potato salad. Our family gatherings would not be complete without it. I have tried many other potato salads, and as far as I am concerned, this is the best! This is one of those recipes that I have a hard time writing the exact amount of ingredients used. I always just cook up a bunch of potatoes and add the ingredients by taste. So, add or subtract ingredients to what you and your family personally like. Instructions have been provided to cook on the stove top and in the Instant Pot pressure cooker. Please check out my Old-Fashioned 4th of July Picnic menu which includes this wonderful Potato Salad. ** Pimientos are roasted sweet red peppers that have been preserved in oil. TIP: After opening and using part of a jar of pimientos, to prolong life of remaining pimientos, add a teaspoon of white vinegar and refrigerate. *** Learn how to correctly cook Boiled Eggs. In a large pan over medium-high heat, add potatoes and cover with cold water; bring to a boil. 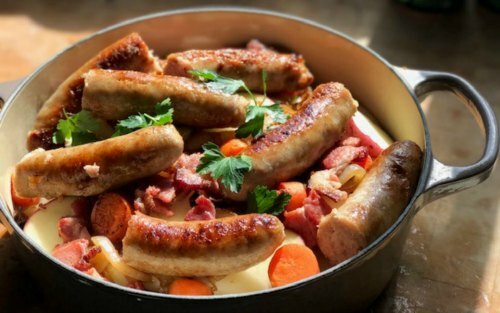 Reduce heat and simmer, uncovered, approximately 15 to 20 minutes or until just tender (the cooking time will depend on the size and weight of your potatoes). Potatoes are done when the internal temperature registers approximately 200 degrees F. on your cooking thermometer. Remove from heat and drain. NOTE: I usually remove the skins when the potatoes have cooled enough to hold. As soon as you can handle the potatoes, cut the warm potatoes into bite-sized chunks and place in a large mixing bowl. Add sweet pickles, onion, celery, and pimiento to the potato chunks. Sprinkle with salt and celery seeds; stir until well blended. Pour salad dressing over the potato mixture; toss gently until well mixed. Add the 5 chopped hard-cooked eggs, gently mixing into potato salad. Refrigerate salad several hours. NOTE: If potato mixture gets too dry, add additional mayonnaise and sweet pickle juice. Place salad into a large serving bowl and garnish with remaining sliced hard-cooked egg. Sprinkle parsley around edge of bowl and sprinkle paprika over sliced eggs. 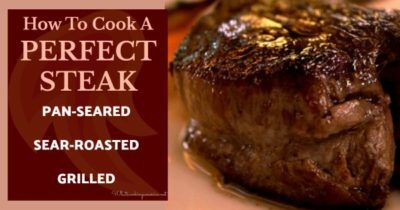 Cover and refrigerate at least 2 hours or overnight before serving. * I usually add more sweet pickle juice - just because I like the taste. You be the judge of how much to add. In a small bowl, combine mayonnaise, prepared mustard, sugar, and sweet pickle juice; stir until well blended. Scrub potatoes. Peel thinly and remove eyes. Cut potatoes into 1 1/2 chunks. To the inner pot, add 1 cup water. Place cut potatoes into steamer or strainer basket and layer on top with eggs. Place the basket of potatoes and eggs into the inner pot. Cover with lid and close to seal. Make sure the pressure valve is also closed to seal. Select the Manual button, high pressure and adjust cooking time to 4 minutes. When the cooking time is done, Quick Release the pressure valve. When the pressure pin drops open the lid and check the potatoes to make sure they are fork tender or when the internal temperature registers approximately 200 degrees F. on your cooking thermometer. Remove the basket of potatoes and eggs from the inner pot and let drain in a clean sink. Place the eggs in a bowl of cold water to cool down. As soon as you can handle the potatoes, cut the warm potatoes into bite-sized chunks and place in a large mixing bowl. When the eggs have cooled, peel and discard the shells. Slice one of the hard boiled eggs and save to garnish the finished potato salad. 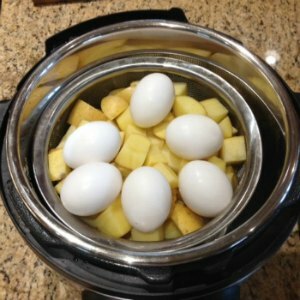 Chop the remaining hard boiled eggs and place in bowl and set aside until ready to use. Pour salad dressing over the potato mixture; toss gently until well mixed. Add the chopped hard-cooked eggs, gently mixing into potato salad. Refrigerate salad several hours. NOTE: If potato mixture gets too dry, add additional mayonnaise and sweet pickle juice. Want to try a fun twist on Potato Salad? Check out our Hawaiian Potato Mac Salad Recipe. A favorite Hawaiian plate lunch staple.